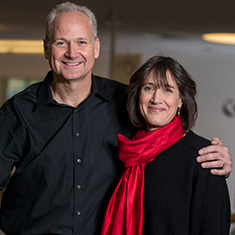 Feb. 5, 2018 — Grinnell College is honored to announce establishment of The Fund for Athletic Excellence Endowed by John Kispert ’85 and Jill Goldberg Kispert for the benefit of the College’s Athletics Department. Established upon the donors’ strong belief that participation in athletics builds character, vital life skills, and passion that translates into every phase and endeavor of life, the fund provides maximum flexibility in addressing future needs and initiatives in Grinnell athletics. Applications will include support for new or existing full-time employment opportunities with a focus on gender equity, and the provision of programmatic support that positions Grinnell athletics as an NCAA leader. Andy Hamilton ’85, Grinnell’s director of athletics and recreation, points to the Kisperts’ passionate personal regard for athletics and their advocacy for the dual sport experience as keys to their philanthropy. John, a Grinnell trustee since 2016, was a four-year starter in basketball who also played baseball and soccer. Jill, who graduated from Vanderbilt University, was a four-year starter in basketball who also excelled in soccer. A portion of the Kisperts’ gift is designated as seed funding, in concert with a group of other alumni, to help launch a Basketball Excellence Fund. In a broader sense, the gift is designed to promote sustainable funding mechanisms that complement the College’s endowment model in supporting the campus community. John Kispert ’85 and Jill Goldberg Kispert with basketball Coach David Arseneault, Sr.
John Kispert is managing partner of Black Diamond Ventures and serves as lead independent director for several technology companies, both public and private. He consults, speaks, and instructs on how to operationalize innovation with an international perspective. Jill Goldberg Kispert is a community volunteer for non-profit organizations focused on education, local public schools, and community service. Prior to this, she was a senior executive specializing in finance and marketing in Silicon Valley crossing the data storage, database software, and internet security industries. The Kisperts live in Atherton, California with their two children. The Kispert family is endowing a fund to benefit the College’s Athletics Department. For information about fund endowments across the College, please contact the Office of Development and Alumni Relations at 866-850-1846.